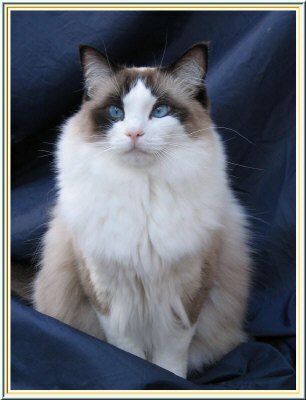 The Ragdoll is a large muscular cat with a broad wedge shaped head and expressive blue eyes. They are semi-longhaired and their coat is softy and silky and rabbit like. They are a beautiful sight in winter with their full ruff and britches. They are nonmatting and we suggest that they enjoy a brush once a week. An adult ragdoll’s size ranges between (4-5kg) for females and (5-8kg) for males. They reach full maturity between three to four years of age. The ragdoll is believed to have originated just prior to 1965. The name was chosen because of its ability and habit of relaxing in the same manner as that of a “Rag Doll”. It is said that it originated from a blue eyed white cat named Josephine owned by Ann Baker. When handling these cats you will notice the tendency to go limp whilst being held in your arms. The Ragdoll has an exceptionally gentle, well-balanced temperament and a lovable personality. It does not display the independence and aloofness for which cats are generally known, but wants to be where you are and will follow you everywhere. It is a personality cat, intelligent, playful and affectionate. They mature into faithful loving lifetime companions. The Ragdoll is a cat of great beauty and it is pure joy to be owned by such an exquisite creature. Ragdolls are extremely affectionate and a great company cat. They easily adapt to new surroundings and other cats, dogs and children and become an important part of the family. They are playful, without being noisy or destructive. They have a quiet voice. All this, and with their non-matting fur make them excellent house cats. Ragdolls are very suitable for apartment dwellers as they are strictly an INDOOR CAT and should not be allowed outdoors unless under close supervision. The Ragdoll can be trained very easily to a harness and lead and enjoy the experience of a walk in the garden. No specific health problems to this breed. Ragdoll kittens are born white, acquiring their colouring and coat pattern by the age of six weeks. Ragdolls are available in the following colours: seal, blue, chocolate, lilac, cream, red and tortie. The varying patterns may be bred in all the above colours. Ragdolls are reasonably low maintenance due to the nonmatting coat. They do enjoy a good brush once a week which helps eliminate any loose hair which can cause furballs. They generally are quite obliging when it comes to a bath which also gets rid of any unwanted hair. Normal maintenance such as worming, flea treatment and their annual vaccination and vet check is paramount for a good healthy cat. If you are looking for a large cuddly indoor companion with very little maintenance and are prepared to share your life totally with you feline companion - then a Ragdoll could be what you are looking for.